祝国强, 莫春横, 李正阳, 王亚军, 李娟. 家鸡G蛋白偶联受体161的基因克隆、分子进化和组织表达[J]. 四川动物, 2017, 36(6): 632-638. ZHU Guoqiang, MO Chunheng, LI Zhengyang, WANG Yajun, LI Juan. 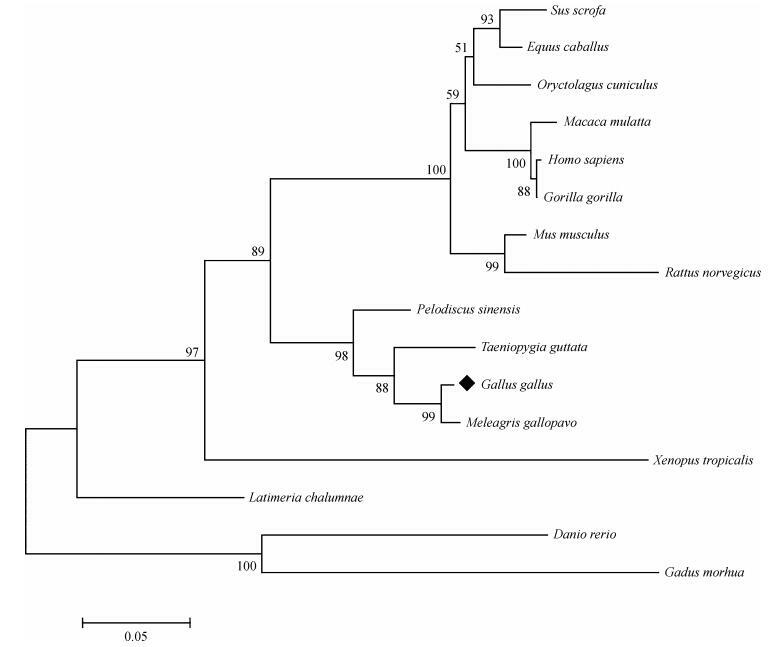 Gene Cloning, Molecular Evolution and Tissue Expression of G Protein-coupled Receptor 161 in Chicken[J]. Sichuan Journal of Zoology, 2017, 36(6): 632-638. *通信作者 Corresponding author, 李娟, E-mail:lijuanscuhk@163.com. Abstract: G protein-coupled receptor 161 (GPR161) is a member of GPCRs, and this orphan receptor plays an important role in the lens development and neurulation of mammals. Recent study showed that the structure of GPR161 was similar with scaffolding proteins and thus may had a potential function in signal transduction. Using chicken as experimental model, the cDNA sequence, molecular evolution and tissue expression of chicken GPR161 gene were investigated in this study. 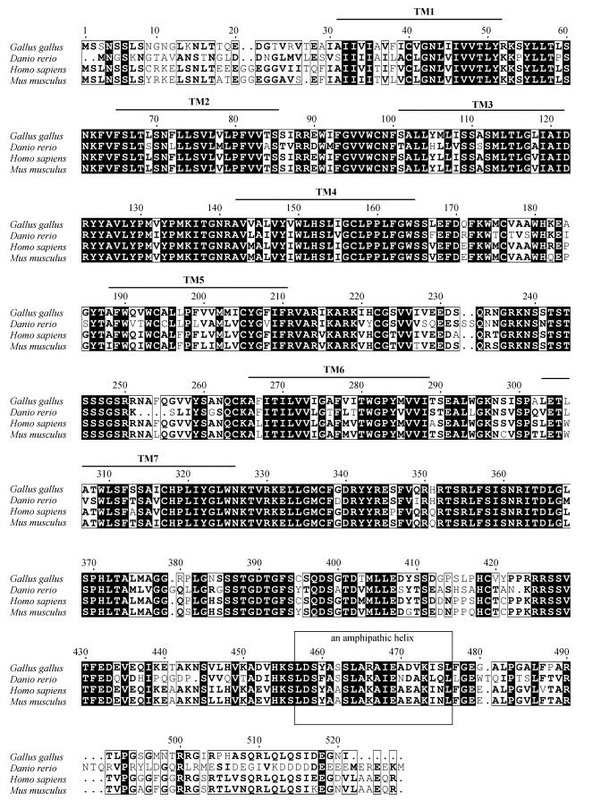 The full-length coding sequence of chicken GPR161 gene was 1 566 bp in length and encoding 521 amino acids. Sequence analysis revealed that GPR161 of chicken had high sequence similarity with that of human (83.0%), mouse (82.6%) or zebrafish (65.8%). 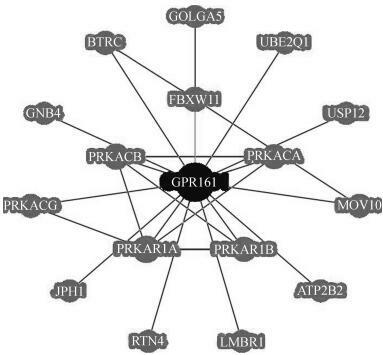 Molecular evolutionary genetical analysis showed that the relationship of GPR161 among chicken, human and mouse were closer than that of chicken and zebrafish. The result of real-time quantitative PCR showed that the mRNA level of GPR161 gene was abundant in testis or ovary, brain, heart and muscle. 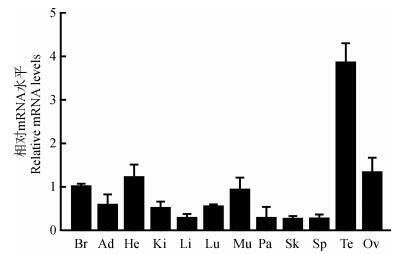 Our data provide a basis for the study of the physiological function of GPR161 gene in birds. 图 2 家鸡GPR161与斑马鱼、人、小鼠的基因编码区氨基酸序列比对 Fig. 2 Alignment of the amino acid sequence of GPR161 gene from chicken, zebrafish, human and mouse TM1~7示经典跨膜区域，两性分子螺旋结构在方框中标识。	TM1-7 shows the typical transmembrane domains, the amphipathic helix is indicated. 图 5 荧光定量PCR检测GPR161基因mRNA在家鸡各组织中的表达 Fig. 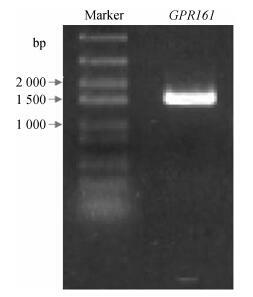 5 qPCR detection of GPR161 gene mRNA expression in chicken tissues Br.大脑，Ad.脂肪，He.心脏，Ki.肾脏，Li.肝脏，Lu.肺，Mu.肌肉，Pa.胰腺，Sk.皮肤，Sp.脾脏，Te.精巢，Ov.卵巢。	Br. brain, Ad. adipose, He. heart, Ki. kidney, Li. liver, Lu. lung, Mu. muscle, Pa. pancreas, Sk. skin, Sp. spleen, Te. testis, Ov. Ovary. Chatr-aryamontri A, Oughtred R, Boucher L, et al. 2016. The BioGRID interaction database:2017 update[J]. Nucleic Acids Research, 45(D1): D369–D379. Morris AJ, Malbon CC. 1999. Physiological regulation of G protein-linked signaling[J]. Physiological Reviews, 79(4): 1373–1430. Mukhopadhyay S, Wen X, Ratti N, et al. 2013. The ciliary G-protein-coupled receptor Gpr161 negatively regulates the sonic hedgehog pathway via cAMP signaling[J]. Cell, 152(1): 210–223.